January is the perfect time to plan for the garden you’ve always dreamed of. It may be chilly outside, but that’s no reason for your work in the yard to come to a halt. You can use the winter months to throw yourself into some great DIY projects. We love this bamboo trellis; it’s surprisingly simple to put together, and it’s super versatile. 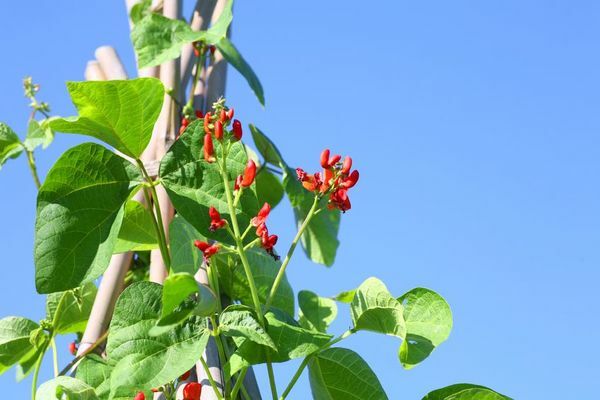 Build several and connect them with at the top with bamboo poles, creating an ideal trellis habitat for peas, tomatoes, melons and cucumbers. You can also use a bamboo trellis with vine plants such as Boston Ivy, Clematis, and Virginia Creeper. Just secure some twine to the top of your trellis, then loop it in a spiral around the three poles. Vines will latch onto the trellis, making your DIY both functional and pleasing to the eye! 1. Take the zip tie and insert its pointy end into the square end, pulling it through until you hear a zip. You should now have a loop! 2. Make a bundle with your three bamboo poles, stacking them so they are shaped into a pyramid when viewed from the bottom. 3. Place your zip tie loop over the bamboo poles. Pull it tightly around them, making sure it’s located above the knot on your bamboo poles. You now have what’s called a tripod. 4. Dig three holes at least 8 inches deep and two feet apart from one another. ‘Plant’ your bamboo trellis in the holes. 5. You’re done! Use the trellis as you see fit, and build more whenever you want! DIY instructions adapted from Organic Gardening.